Golf irons make up most of the golf clubs in a players’ bag. Choosing the ideal set can be one the most rewarding decision a golfer makes in improving their game. With so many irons available, and with each offering different specifications, it can be tough trying to find out which are best for your game. This buying guide to 2018 golf irons offers useful advice on getting the golf iron that’s best for you. Some of the best golf irons include the TaylorMade M4 Irons, which offer players best in launch, forgiveness, distance and a more controllable flight. RIBCOR localises face flexibility in the hitting area to transfer more energy to the golf ball and increase distance and forgiveness. It also stiffens the perimeter of the head to create a more rigid structure, enhancing sound and feel. RIBCOR mitigates toe flexibility for tighter dispersion. 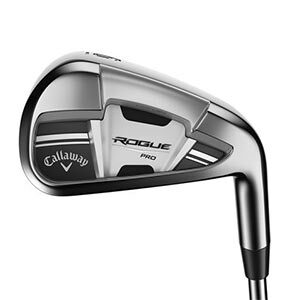 The Callaway Golf Rogue irons are another top-of-the-range iron which offers golfers maximum distance, height and forgiveness The face technologies are geared to provide you with more ball speed, across a greater area of the club face. This will generate more distance and will provide you with more forgiveness on off-centre hits. 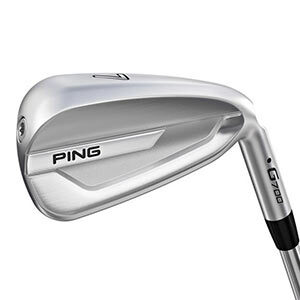 Another great option is the PING G700 Steel Irons, which revolve around a strong, powerful design. The hollow-body construction, made from 17-4 stainless steel, allows for an internal geometry design the positions weight away from the face. This creates a frame for metal-wood-like flexing and a high COR to greatly increase ball speeds giving you a higher trajectory and a longer flying shot. Most golfer who play exclusively at high handicap are often told to use super game-improvement irons as these offer greater forgiveness, and have the highest available offset--they’re easier to hit for golfers who struggle to get the golf ball higher. Handicaps of 21-28 will find these clubs offering the lowest COG to help with higher golf ball flight, and they also come with the largest club head perimeter for a greatly improved forgiveness. There’s more forgiveness to take advantage of if playing at mid-high handicap. Game-improvement irons, though easy to use, do tend to have a slight bias towards mid-handicap, but their low COG will get the golf ball higher at steeper angles. Intermediate golf irons are all about dual performance and forgiveness. A mid to low handicap (8-17) is imperative for getting the most from these clubs, as putting one into the bag means a much less forgiving iron will be in play, meaning you must possess more skill when playing at this level. COG is slightly different from its game-improvement counterparts, too, utilising a steeper angle and less height carried onto the green. Player’s irons are for the most experienced golfers only, for those who have mastered their own game and feel confident in their shot-shaping and feel. Golfers playing off a handicap of 0-10 (low) will benefit from these irons ten-fold. They can also enjoy the lowest, deepest COG available by using these irons. This section will show you which irons heads should be considered for golfers of all levels and stages in their development. Oversized cavity back heads are the easiest to hit as its surface area is bigger and the vast majority of its weight is stored around the perimeter. The club head is generally more forgiving than its smaller counterparts, and off-centre hits generally fly straighter and farther. Still forgiving, cavity back irons have hollow heads to remove weight from behind the centre of the club face. This helps more of the club head’s mass around the perimeter. With the change to the physical appearance and weighting characteristics, the physics of impact between club face and golf ball are also adjusted, resulting in a golf iron that’s easier to hit, and achieves a wider range of forgiveness for golfers. Muscle back irons have a full back of the club head as opposed to the hollowed out cavity back iron. Muscle back irons provide golfers with greater feedback, but also demand the golfer contact the golf ball with the centre of the club face with much greater consistency. By Using muscle back irons, players run the risk of losing a little distance and worse feel on off-centre hits. Muscle backs have higher centre of gravity location, which produces lower trajectory that’s preferred by many golfers. The cavity backs perimeter weighting and lower moment of inertia allows for more forgiveness. Blade head irons have more weight positioned behind the middle of the golf club but are very unforgiving and any badly struck shot will be punished. Blades are preferred by most top golfers because it allows them to more easily work the golf ball; plus, it feels softer at impact. Blades have a much smaller sweet spot, but the rewards for mastering this golf club head is well worth the practice. Forged clubs are made by taking a piece of soft steel and beating it into shape. Many golfers claim that forged clubs offer better feel because the steel used in the forging process is softer due to the higher carbon content. Players who use forged clubs get softer feel with shots as well as greater control. The forged head is generally preferred by lower handicap golfers and costs a bit more, but better players will revel in its ability to help them save shots. The vast majority of golfers, probably around 90% - purchase golf clubs made by casting – which involves pouring molten metal into a mould to produce a golf club head. This is a cheaper alternative to forged irons and many more golfers will find it easier to handle than they might with the forged. Many companies will also tell about how soft cast heads are, but always remember that the harder the face of the club, the faster the golf ball will come off of it. Steel shafts weigh more than their graphite counterparts and increase consistency at higher speeds. Golfers whose swing speeds is between average to quick will benefit the most from using steel shafts. Female and senior golfers might fare slightly better with a graphite shaft, which weights less and encourages quicker swing speeds for greater distance in each shot, and ideally they are suited to player’s with slower swings. It’s important to consider shaft flex as it refers to the ability of a golf shaft to bend as more force is applied during golf swing. The force is determined by the kind of golf swing you possess; be it fast, slow, jerky or smooth, and there are 5 generally used ratings for shaft flex: Extra stiff, stiff, regular, Senior (or light) and ladies. As the shaft flexes throughout the swing, the position of the golf club head changes. The face of the golf club must be perfectly straight (squared) at impact to get the most out of every shot. There is less chance that you will make contact with the golf ball using a square club face if you have the wrong flex for your swing, so making sure this is correct should take prominence.